"Just the incredible spirit of this kitten to be surviving out there for a week. I have no idea how he survived." 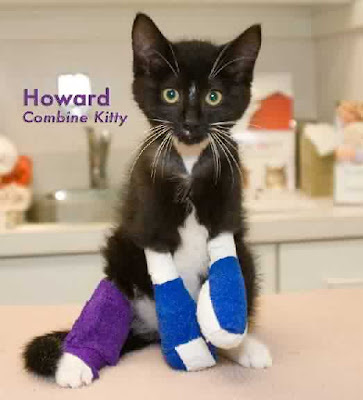 Ten-week-old Howard was playing in a wheat field in Alaiedon Township, Michigan, one day in late July when he was run over by the operator of a harvest combine. His front paws were severed and left dangling at the ends of his tiny legs. He also sustained an unspecified injury to one of his rear legs. Despite the horrific pain and loss of blood, he was able to somehow crawl into a ditch alongside the field. He remained there for at least a week suspended between life and death and with nothing to either eat or drink while his badly mangled flesh began to rot away and the maggots attacked him like a horde of famished locusts. Most likely that ditch would have become his final resting place as so many others like it have come to serve countless other feline victims of ailurophobic motorists and farm equipment operators. The fact that he did not join that lengthy list of unrecorded fatalities is attributable to the better late than never intervention on July 30th of ten-year-old Kyle Billingslea and his eight-year-old brother, Bryce, who heard his plaintive cries for help as they were riding their bicycles down Willoughby Road. While it would have been as easy as pie for them to have either turned away or, tant pis, made sport of Howard's misery, that is not what they did. Fighting off the natural revulsion that they surely must have felt at the sight of the maggots and the god-awful smell emanating from his body, they instead picked him up and carried him to a nearby farmhouse. The unidentified landlord then summoned Ingham County Animal Control Officer Gary Ireland who came and collected the slowly dying kitten. 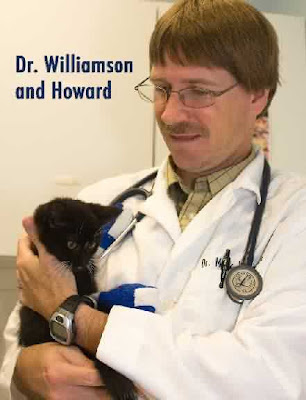 Although he doubted that Howard would make it through the night, he nevertheless compassionately transferred him to the nearby Lansing Veterinary Medical Center. Against all odds, Howard was still alive the next morning. Unfortunately, it was not possible to save his injured paws and they had to be surgically removed. A certain amount of infected tissue on his legs also had to be excised but veterinarians were able to save the appendages themselves. The trick now is going to be getting new tissue to grow on his stumps. He underwent a second surgery recently and is said to be doing well but he is still going to need several more operations plus prosthetics in ordered to replace his severed paws. The good news, however, is that he is not only going to live but should be able to lead a relatively normal life. "It's as if he knows people are pulling for him and he doesn't want to let them down," Jamie McAloon Lampman of Ingham County Animal Control and Shelter (ICACS) in nearby Mason stated recently on the department's web site. "He has endured pain most other cats would not have survived, yet he purrs at the touch of a human hand and seems to have the heart of not a kitten, but a lion." That certainly would seem to be the case considering all that he has been forced to endure. For in addition to the pain and other deprivations, he had to live with the constant fear that his presence would be detected by a predator and without either his claws or the use of his legs he would not have had a prayer in Hell of defending himself. Sleep would have been pretty much impossible and the psychological horrors occasioned by the hopelessness of his predicament must have been nearly unbearable. "Just the incredible spirit of this kitten to be surviving out there for a week," Lampman marveled to the Lansing State Journal in the article cited supra. "I have no idea how he survived." While few occurrences could ever come close to equaling what Howard has accomplished, the transformative effect that he has had on the residents of Alaiedon and the surrounding areas has been pretty remarkable in itself. "He is inspirational to all he comes in contact with from the young boys who saved him, to the veterinarians, the animal control officers, and all those who have offered to help with his medical costs," ICACS states on its web site. "As he continues to thrive so does our faith in the human race." In a certain sense, it could be argued that Howard has done more for the residents of Alaiedon than they have done for him. "His story has evoked compassion and empathy within our community and for that we all owe Howard a debt of thanks," ICACS goes on to say. "Who would have thought he would be the one who would give us so much more than we could give him: a humane sense of community." Lampman put the case much more succinctly when she told the Lansing State Journal, "He stole the hearts of everyone...who looked at him." As remarkable as Howard's rescue and recovery have proven to be, this tragic case has raised several troubling issues that have yet to be addressed. In particular, although au premier coup d'oeil it would appear that he was born in the wild, his friendly disposition toward humans tends to indicate otherwise. If that is indeed the case, it is nothing short of appalling that his previous caretaker has not come forward to reclaim him. This callous attitude could be attributable to either financial considerations or simply an uncaring attitude. In the end it is perhaps just as well because Williamson and ICACS are not expending this much effort and resources on him only to turn around and let just anyone adopt him. It is a sure bet that all prospective adopters will be vetted thoroughly before a good home is selected for him. Secondly, the combine operator who ran over Howard has been neither identified nor charged. Moreover, it is doubtful that either the police or humane officials are even bothering to look for him. After all, Alaiedon is located in the heart of farm country and killing animals, either for profit or by accident, is looked upon as being simply part of a normal day's toil. While it is theoretically possible that the attack could have been accidental, that is highly unlikely. 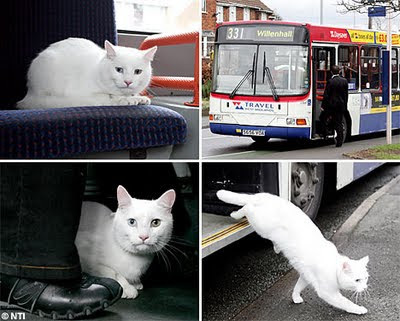 Cats and kittens run like the wind at the approach of humans and this is doubly true of large, noisy vehicles, such as cars, combines, and trains. The truth likely never will see the light of day, but it is a good bet that Howard was run down deliberately. Of all the modern equipment employed in the production of agriculture, combines in particular exact a heavy toll upon animals and this is borne out by the multitudes of dead squirrels, rabbits, opossums, groundhogs, snakes, birds, and other animals that litter farm fields once they have been divested of their wheat, oats, barley, maize, soybeans, flax, and other crops. 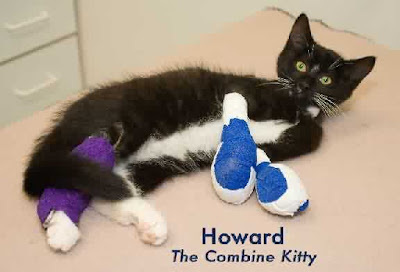 While the victims of these kamikaze combine operators are predominantly wildlife, occasionally domestic animals, such as Howard, are injured and killed as well. Worst still, the protection of animals from the ravages of modern farming techniques is not even an issue. Neither farmers nor consumers care about their safety and even animal welfare groups are reluctant to take on with big agriculture. Considerably less publicized is the fact that it seldom acts to protect even threatened and endangered species of wildlife. Instead, it spends the majority of its time and resources pimping and whoring for farmers, ranchers, and other economic interests. While the deleterious effects that fertilizers, pesticides, herbicides, annuals, and genetically-modified organisms have upon the environment receive considerable attention, agriculture's impact upon animals is seldom discussed. First of all, land used in the production of food must be cleared of all trees, plants, shrubs, and grasses. Next, the soil must be tilled and, most often, polluted. All of these activities not only deprive animals of their homes but their food sources as well. Furthermore, their reproductive cycles and nurturing activities are disrupted as well. Many of these same calamities also are visited upon a multitude of valuable insects such as bees and butterflies. Whenever these displaced animals and insects attempt to reclaim what little is left of their former abodes their only reward is to be chopped to bits and pieces by the operators of farm equipment. Even those lucky enough to escape with their lives seldom have anywhere else to live. Whereas the loss of habitat occasioned by a growing demand for food may be largely unpreventable, there are several measures that farmers could implement in order to safeguard both domestic and wild animals from being killed and maimed by combine operators. For starters, fields should be cleared of all animals beforehand. Secondly, crop harvesting should be restricted to daylight hours and combine operators should be instructed to go about their business more deliberately so as to watch out for animals. Unfortunately, since time is money it is unlikely that these suggestions will be received favorably. "The debate over climate change completely distorts our perspective," Josef Reichholf, a biologist at the Munchen State Zoo told Der Spiegel on November 23, 2007. (See "Biologists Debate Relocating Imperiled Species.") "Industrial-scale farming is the number one killer of species." As for Howard, with his medical bill expected to exceed $2,000, he desperately needs the public's continued support. Anyone willing to be of assistance can contact the ICACS by snail mail at 600 Curtis Street, Mason, Michigan 48854 or by telephone at (517) 676-8376. For whatever reason, ICACS has elected not to use its own money in order to cover the cost of Howard's treatment. This is absurd! 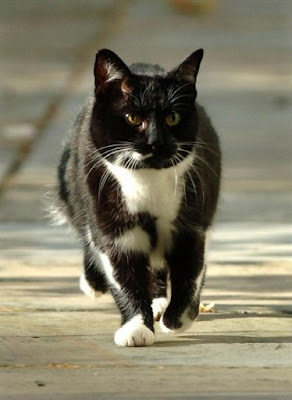 The care of injured cats and other animals is a legitimate public expenditure if there ever was one. In fact, spending money to treat injured animals is far preferable to squandering trillions of dollars on imperialistic wars, Wall Street crooks, and incorrigible automakers. Unfortunately, as the current debate over health care reform has demonstrated, Americans have little compassion for their fellow citizens, let alone the animals. Their parents obviously have instilled in them an abiding appreciation for cats and other animals. They accordingly should be extremely proud of them because they are genuine heroes in every sense of the word. 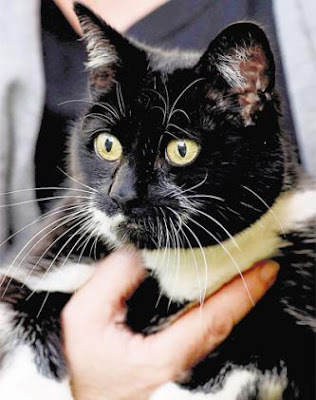 Photos: Ingham County Animal Control and Shelter. "I very, very much regret what happened that night. I am not that kind of person." "Six assaults against people and now this against a cat and you're up here trying to tell me you're not that kind of a person?" 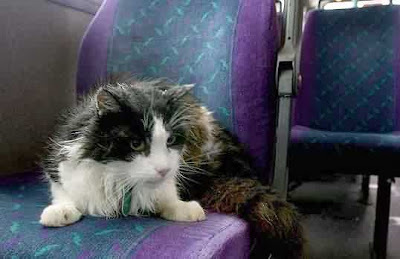 Scatt later was discovered bleeding and near death in the church's parking lot by shelter employee Michael Stinnette who rushed him to South Seattle Veterinary Hospital where physicians somehow were able to save his life. He was discharged from the facility on April 28th and at last report was still living at the home of Pastor Jerry Wilson and his wife, Jennifer. Not contented with simply committing this heinous assault, Clark decided to share his devilry with a fellow inmate at the shelter and this is what ultimately led to his undoing. 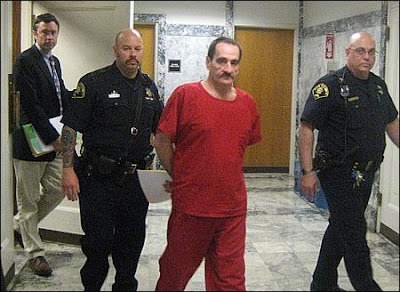 To his credit, the fellow lodger ratted out Clark and as the result officers from the King County Sheriff's Department were able to arrest him the following day. On April 22nd, prosecutors charged Clark with one count of first degree animal cruelty. At first he ludicrously claimed that he had gutted Scatt in self-defense but on June 29th he abruptly changed his tune and pled guilty. Like the Jekyll and Hyde character that he is, the forty-eight-year-old drifter from Vancouver, Washington, put on a charm offensive for the benefit of Judge Michael C. Hayden. "I very, very much regret what happened that night. 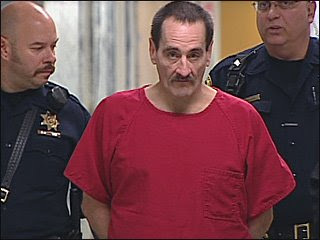 I am not that kind of person," he is quoted as having told the judge by KOMO-TV of Seattle on July 17th. (See "Man Who Slit Open Church Cat Gets Nine Months.") "I apologize to the court. I apologize to Scatt very much. I mean that from my heart." At first Hayden appeared not to have been taken in by Clark's feigned remorse. "Six assaults against people and now this against a cat and you're up here trying to tell me you're not that kind of person." he shot back. "(How) would you explain your six prior assaults on people?" "You are using alcohol as an excuse," Hayden chastised him. "You're the one who drinks the alcohol, you're the one who beats up people when you're drinking alcohol, and now you just happen to have done it to a cat." From his tough talk it initially appeared that Hayden is a judge who cares about cats and takes crimes committed against them seriously. Sadly, that ultimately proved not to be the case as his whirlwind of rhetoric about justice quickly blew itself out into a pip-squeak fart of injustice. Press reports are silent on the matter, but he additionally could be eligible to receive time off for good behavior and as a result be out of jail fairly soon. Moreover, he apparently was not placed on either probation or required to perform any community service. Perhaps most startling of all, Hayden refused to hold him accountable for Scatt's not insubstantial medical bills which are currently being paid by Pasado's. Since Clark drinks like a bleeding fish all the time and sometimes does illicit drugs, he obviously is getting money from somewhere and therefore should have been required to have made restitution. As things now stand it certainly appears that Clark's only real punishment was the nearly three months that he spent in the can while awaiting trial and that was necessitated solely because of his inability to make bail. If he had been able to have posted ten per cent of the $50,000 bond under which he was being held, he would have gotten away scot-free. It additionally is acutely disturbing that Hayden apparently did not express one iota of concern for Scatt who nearly had his life taken away from him and still faces months of painful recuperation. Au contraire, all of his compassion and concern were lavished on Clark. It is highly unlikely that Hayden would still be sitting on the bench if Clark's victim had been a man or a woman. After all, any legitimate judicial system should save its compassion for the victims of violent crime, whether they be animals, humans, or the environment, and not reward miscreants like Clark. The prosecution's handling of this case was every bit as disgraceful as Hayden's ludicrous ruling. For starters, prosecutor Craig Peterson demonstrated from the outset how little he values feline life by seeking only a nine-month sentence. Even the management of Pasado's was left giddy by the decision. "Scatt Gets Justice! Tracy Clark Gets Nine Months," it proclaimed July 17th on its web site. 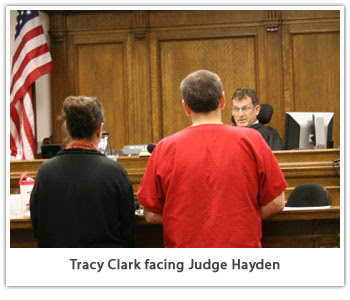 "Judge Hayden wasn't fooled by Tracy Clark's insincere claim of regretting his actions." There are only two possible explanations for non sequiturs of that sort. Either officials of Pasado's have a very underdeveloped sense of justice or they have been in Clark's hooch. The organization's operations manager, Brendan Brannen, struck a much more sober tone when he was interviewed by KOMO-TV. "He (Clark) had six priors for violence and then he's put in there for nine months. No, it doesn't fit the crime but at least it does show that you will get punished," he stated in a video accompanying the article cited supra. Other than issuing those contradictory statements, Pasado's limited its involvement in the trial to photographing Clark and thanking Peterson for his lackluster effort. Nonetheless, that was considerably more support than Scatt received from the good Christians at Cross Church who did not even bother to either attend the proceedings or to testify on his behalf. While it is not known where Cross Church gets its moola, many church-run shelters are funded by the government. C'est-a-dire, the politicians and bureaucrats pay them a bounty for every homeless person that they drag off the streets and lock up for the night. In fact, these moneygrubbing followers of Christ often can be spotted prowling such familiar haunts of the dispossessed as bus and train depots in search of their next victims. The entire shelter system is a big racket and this is proven by the petit fait that the genuinely needy are lumped in under the same roof with criminals, drunkards, dope addicts, and mental patients. Assaults, thefts, communicable diseases, and nightly raids by the police are de rigueur. Consequently, most halfway decent individuals avoid these hellholes like the plague and instead choose to rough it either in the woods, on the street, or on buses and trains. The fraudulent nature of this despicable system is further demonstrated by the fact that very few inmates ever graduate to either permanent abodes or jobs. Shelters are thus ends in themselves and that is why Cross Church so desperately wants Clark to return to the fold; he is one of their meal tickets. Fortunately, the Wilsons have not announced any intention of returning Scatt to the church although they have rebuffed Pasado's offer to secure a permanent home for him. Hopefully, they will give him the medical treatment, security, and love that he so richly deserves. As long as Cross Church continues its disastrous policy of giving shelter to criminals, drunkards, dope addicts, and mental patients, no cat is going to be safe on the premises. Moreover, the church should be lending a helping hand to the genuinely needy instead of squandering precious resources on habitual losers. Even more alarming, it is highly unlikely that society has heard the last of Clark. Once he gets out of jail, he is sooner or later going to get in his cups and commit more violent offenses against both cats and individuals. Besides, since there is nothing more aggravating to an already parched palate than to be lectured day in and day out about the evils of drink, the time that he spends in rehab could actually end up exacerbating his drinking problem. Es ertrinken mehr im Glas als in allen Waessern. Consequently, the next time that he commits a violent offense the victim's blood is going to be all over Hayden's and Peterson's hands. Not only have they failed to provide justice for Scatt but to protect society as well. As Barbara Ehrenreich pointed out in the August 9th edition of The New York Times, it is ridiculous for society to imprison nonviolent offenders for such petty offenses as sleeping in the street, littering, jaywalking, panhandling, and refusing to pay their bus and rail fares. (See "Is It Now a Crime to Be Poor?") She neglected to add, however, that it is every bit as crazy not to permanently jail repeat violent offenders. "Everybody I've helped has helped me so much in a situation that brings it all around. Everything you give you get back." It was bound to have happened sooner or later but now that it has befallen a twenty-eight-year-old Georgia woman certainly does not make it any less heartbreaking. Sometime near the end of June, Rachel Honeycutt was motoring down the hectic East-West Connector in Cobb County when she witnessed two unidentified women tossing an unspecified number of kittens out of their vehicle into the middle of traffic. Being an animal-lover who owns seven cats and one dog, she did not think twice about pulling over, getting out of her car, and mounting a rescue. She had almost pulled it off but when she bent down to pick up one of the kittens she was blindsided by an oncoming motorist. She was hit so hard in fact that she was knocked seventy-five feet into the air and landed on the far side of the roadway. Battered and bruised from head to toe, she was rushed to the hospital where she was diagnosed to have suffered a shattered pelvis as well as brain and organ damage. She soon lapsed into a coma which necessitated her being placed on life-support equipment. Although more than seven weeks have passed since the time of the accident, the good news is that she is now out of intensive care and is going to live. Her prognosis has not been publicly announced but cat-lovers all over the world are praying that she will eventually make a full recovery. She has recently regained her memory and that is a positive sign. "I got out to save the kittens," she recalled for WXIA-TV of Atlanta on July 31st. (See "Woman Severely Hurt Saving Kittens.") "Somebody was putting them in the middle of the East-West Connector." Because of WXIA-TV's elliptical reporting, the fate of the kittens is unknown. The station also fails to mention if she was struck by a hit-and-run motorist or if an arrest has been made in the case. While the kitten dumpers and the motorist apparently have gotten away scot-free with their evil deeds, the police in an act of infinite callousness have written Honeycutt a citation for being in the roadway. A similar thing happened to sixty-year-old Jozsef Vamosi of Fairfax, Virginia, on June 18th when he was given a ticket for jaywalking after he left his vehicle in order to help a gaggle of Canada geese across the busy Fairfax County Parkway in Reston. In addition to the citation that she received, Honeycutt has skyrocketing medical bills and is in danger of losing her new house. It has been saved for the time being by family members and friends who have been paying her mortgage as well as taking care of her cats and dog. Having nearly lost her life plus being on the receiving end of so much pain, no one could rightfully blame Honeycutt if she were embittered by her fate. That is hardly the case, however. "I can't believe I'm okay," she instead told WXIA-TV. If anything, her close call with death has strengthened her resolve and faith in humanity. "Everybody I've helped has helped me so much in a situation that brings it all around," she added. "Everything you give you get back." This truly tragic case underscores once again what a no man's land the streets and highways have become for both animals and pedestrians. This perilous situation is compounded by faster and quieter running automobiles that are virtually impossible to detect until it is too late. Distracted drivers as well as those who indulge in alcohol and drugs only serve to make a bad situation worse. The real culprit, however, is the near total disregard that the motoring public has for both animals and pedestrians alike. Most of them care only about rushing to work so that they can collect their precious shekels and then racing home at night in order to indulge in their various vices. Not only do the rules of the road mean absolutely nothing to them, but a red light is interpreted as a signal to stop wasting time and to step on the gas. A few of them no doubt even get a kick out of running down and killing cats and pedestrians. 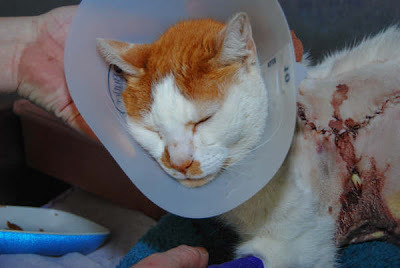 Nevertheless, as long as there are cretins in this world who insist upon disposing of unwanted cats and kittens on busy thoroughfares there are going to be kindhearted souls like Honeycutt who are going to be willing to risk their lives in order to save them. "I'm not at all surprised she stopped to save the kittens," Honeycutt's mother, Sheila, told WXIA-TV. It is precisely the kindness of individuals like Carol and Kim Jones, Judge Catherine DiDomenico, Michele Laney, Catherine Barton, Rachel Honeycutt, and Jozsef Vamosi that keep this wicked old world from spinning out of its orbit. These dedicated and selfless individuals are therefore to be cherished and honored for their heroic deeds. 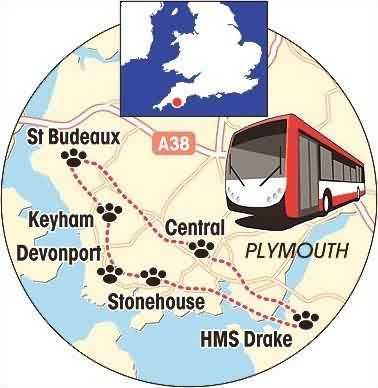 At the same time it is imperative that they and all other like-minded individuals exercise extreme caution whenever leaving their vehicles in order to rescue cats and other animals. 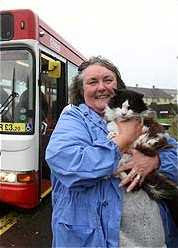 As Rachel has found out, not everyone shares their respect for all living creatures. It also is unconscionable for the authorities to issue citations to individuals like Honeycutt and Vamosi. She has suffered enough and certainly does not need legal troubles on top of her urgent health and financial needs. As for Vamosi, eleven geese are alive today thanks to his concern. Moreover, these much maligned birds need all the help that they can get. Much more pertinently, streets and highways would not be such deathtraps for both animals and pedestrians if the police would enforce the existing traffic laws. After all, public thoroughfares should be shared but that is a dirty word in America. In conclusion, although it is tempting to sarcastically congratulate the kitten dumpers for the pain and suffering that they have caused Rachel, that would be a total waste of time. Anyone capable of dumping kittens in traffic is equally incapable of feeling an ounce of remorse for what they have done to one of their would-be rescuers. 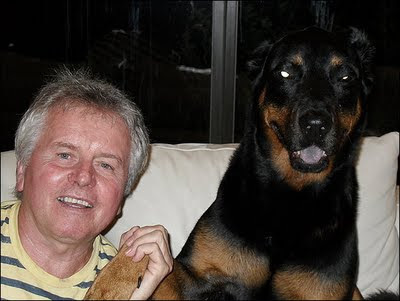 Photos: WXIA-TV (Honeycutt) and Linda Vamosi (Jozsef and his dog). Hoteliers certainly were pleased with the turnout in that there was scarcely a spare room to be found for miles around. Local merchants also cleaned up by selling souvenirs, posters, postcards, masks, and almost anything else that either bore the likeness of a cat or could be fashioned into resembling one. Since both locals and out-of-towners had to be fed, local restaurants and confectioneries made out like bandits. So, too, did the bars where the beer flowed freely. During the Middle Ages, Ieper was a bustling textile manufacturing town and in order to safeguard the finished products cats were recruited to keep Cloth Hall free of rodents. Once they started to multiply beyond their need, the ungrateful and predatory merchants rewarded them for their invaluable service by disposing of them via Kattenworp. 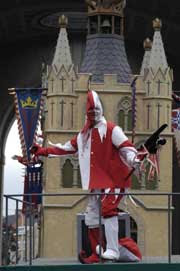 The inclusion of Kattenworp demonstrates both a lack of taste as well as contrition on the part of the citizens of Ieper. Moreover, to celebrate the commission of past evils inflicted upon totally innocent cats is not any different than if practitioners of genocide were to dance jigs on the graves of their victims. The crimes committed by both capitalists and Christians against cats and other animals are so extensive that they dwarf by a wide margin even their transgressions against their fellow man. 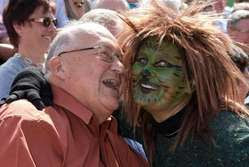 "We have enslaved the rest of the animal creation, and have treated our distant cousins in fur and feathers so badly that beyond doubt, if they were able to formulate a religion, they would depict the Devil in human form," former Anglican priest and dean of St. Paul's Cathedral William Ralph Inge wrote in Outspoken Essays in 1922. As most individuals now freely acknowledge, witches never did exist and there most definitely is nothing satanic about cats, black-colored ones included. Unfortunately, neither Kattenworp nor the burning of witches in effigy do anything to dispel these age-old prejudices. 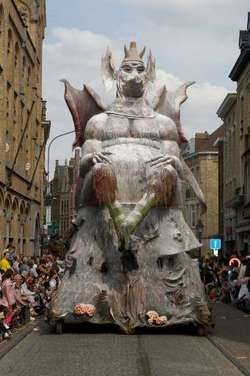 If the city of Ieper had either any decency or conscience it would not only discontinue these loathsome practices but issue a formal apology for its past crimes against both cats and women In the final analysis, there is something inherently perverse about a city that insisits upon wallowing in its own wickedness. 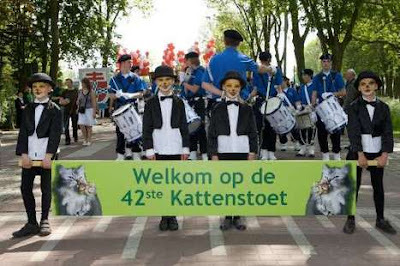 Even though the citizens of Ieper may steadfastly insist that Kattenworp is clean, wholesome fun, it is important to remember that it was not always that way. "Though boys throw stones at frogs in sport, the frogs do not die in sport, but in earnest." the ancient Greek poet Bion once wrote. So, too, was the case with the thousands of cats who had their brains smashed to smithereens and their bones splintered beyond repair when they landed in Grote Markt and that is something only an inveterate ailurophobe could celebrate. Photos: De Morgen (Kattenstoet, Dehaene, and float) and City of Ieper (jester).